How can you use the IPCC in your classroom? With the world all abuzz about the recent release of the fifth edition of the IPCC report, many teachers are no doubt wondering how to take advantage of this teachable moment. Should they address the report in social studies? In an environmental sciences course? How can they address the report without overwhelming or terrifying students? Most importantly though, how can they fit it into an already full curriculum? In our experience at NCSE, it is not about fitting climate change into an already full semester; it is about understanding where climate change already fits. Though every state has different science standards, most cover the same topics–though in differing detail and often in different years. As a result, I’ll share some suggestions that can apply to many different states, allowing teachers to address the IPCC’s user-friendly Summary for Policy Makers report while still covering the standards required by their state. If your state has standards regarding climate. Climate is typically addressed in middle or high school earth science courses. 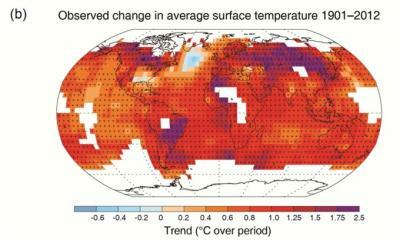 An easy place to start is Figure 1 in the report, which addresses land and ocean surface temperatures over the last century. This is a great opportunity to talk about how ocean, land, and atmospheric temperatures differ and why some parts of the world are warming at a faster rate than others. 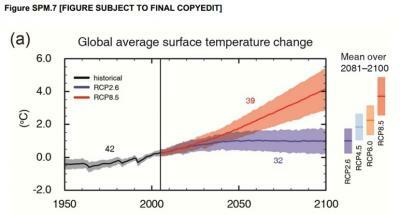 Figures 7a and 8a show projections into the future for surface temperature change, which could be used for a discussion of climate models. You could also use Figure 5 to discuss how different atmospheric gases and aerosols impact climate, as well as the often conceptually challenging concept of “radiative forcing”. For middle school students, try this activity explaining how ice cores can be used to determine prehistoric climate or this one using tree-rings to determine ancient climates. For high school classroom activities, try this one on understanding regional climate differences due to climate change or this one on “normal” climate patterns. If your state has a standard regarding the water cycle. Understanding the water cycle is vitally important to learning about climate change impacts. 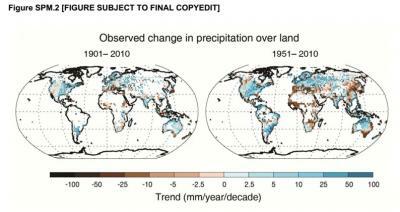 For this discussion, use Figure 2 which shows observed changes in precipitation over land for the past 100 years. Figure 8b shows two different predictions for the future under two different scenarios of greenhouse gas emissions (low vs. high emissions). For middle schools, use this activity involving sea level rise. It does a nice job addressing on a larger scale how melting glaciers in the arctic can impact sea level here in the US. For high school students, consider this activity on the connection between ocean currents and climate or this one that looks at the relationship between droughts and wet periods during the height of Mayan civilization. If your state has a standard on how climate change can affect organisms and their distribution. Looking at the history of climatic change millions of years ago is a great way to talk about climate change now. I recommend using Figures 7a and 8a which show projections into the future for surface temperature change. Ask your students to discuss how this could affect animal distribution and health. For middle school students, use this activity regarding the impact of climate change on arctic caribou, addressing animal distribution and success. Or consider joining the phenology network to get your students involved with citizen science! For a high school classroom, try this activity on how pollen is used to track plant distribution going back millions of years. From there you can discuss how climate affects plants, why certain plants only grow in certain climates and how we can use the pollen record to understand paleo-climates. If your state has a standard on understanding human health and disease. Climate change will impact the spread of disease across the globe. The IPCC is an opportunity to talk about where diseases currently occur, how they are transmitted, and how this might shift with climate change. I recommend using Figures 7a and 8a, which show projections for surface temperature change and how this could impact human health and disease. In addition you can bring in core ideas regarding hosts, parasites, vector-borne diseases, and their life cycles. For middle school students, try this one addressing how climate change can impact disease and biodiversity loss. A good activity for high school students is this one addressing climate change impacts on disease or this one regarding impacts of climate change on malaria. Acids and bases are a natural place to talk about climate change in a chemistry course. It has long been recognized that shelled animals will be greatly impacted by shifts in ocean pH from climate change. 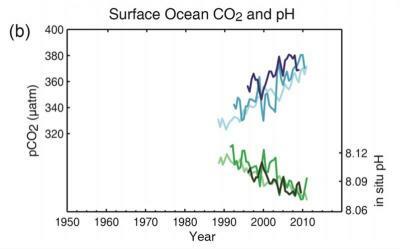 An excellent demonstration of how the ocean’s pH has changed with increasing carbon dioxide is Figure 4, while Figure 8d has predictions for the future. For videos on how ocean acidification works, try using this one from NOAA on ocean acidification and the sea butterfly. For middle school students, use this activity from NOAA on ocean acidification in conjunction with the IPCC figures. For high school students, use this virtual lab on sea urchins from Stanford University. Have other suggestions of how to use the IPCC in your classroom? Add them to the comments below; we'll be compiling the best suggestions for our website.